South Dakota Tribes Accuse State Of Violating Indian Welfare Act Eight tribes have delivered a report to Congress saying South Dakota is willfully ignoring a federal law meant to protect Native American children. Several lawmakers are demanding action. The Bureau of Indian Affairs on Wednesday agreed to convene a summit meeting of key players, and says it will urge state officials to respond. This week, officials from the Crow Creek Sioux Nation and seven other tribes in the state sent an extensive report to Congress accusing South Dakota of systematically violating the 35-year-old federal Indian Child Welfare Act. The federal law says that, with some exceptions, if the state removes a Native American child, the state must place that child with relatives, tribal members or other Native Americans. 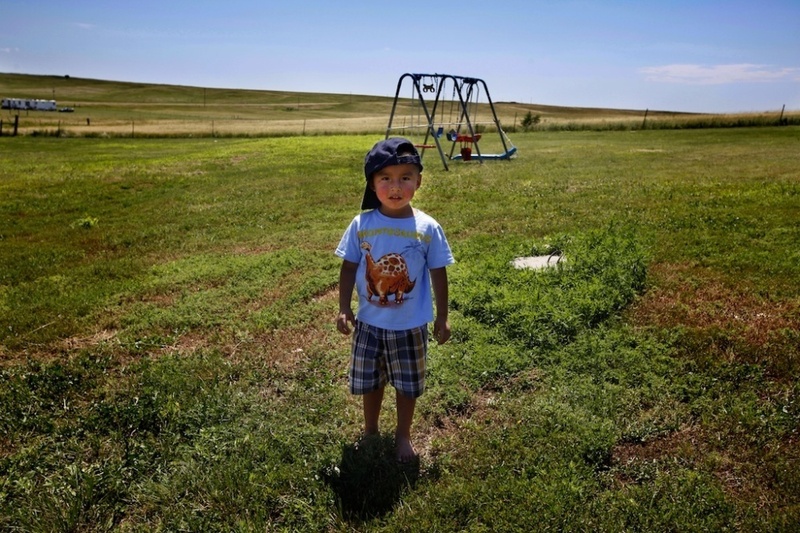 The report, which the officials wrote with the help of the nonprofit Lakota People's Law Project, concludes that in many instances the state does not have the authority to remove native children from tribal land. When the state does have that authority, through a tribal court order or tribal council agreement, the report says the state is failing to place the majority of those children according to the law. An NPR series last year found that 87 percent of the Native American children in foster care in South Dakota are placed in white foster homes or group homes. The 22-page report from the tribes also charges that the state has a financial incentive to remove Native American children from their tribes. It says the state gains federal dollars for every native child it places into its foster care system. Officials with the state's Department of Social Services did not respond to requests for comment. But they have told NPR in the past that they strongly reject the notion that the state has a financial incentive to place children in foster care. They say the federal money the state receives does not influence their decision-making. They have also said that finding Native American foster families who meet their guidelines has been extremely difficult. The report landed on the desk of Rep. Ben Lujan, D-N.M., on Monday. "It makes you angry," Lujan says. "I hope it makes people's blood boil. This is emotional, and it's real, and it's not right." Lujan is a member of a bipartisan coalition of lawmakers looking into state compliance with the law. The group is hoping to hold hearings on Capitol Hill this spring. Lujan says he was most disturbed by what appears to him to be a lack of information coming from South Dakota's Department of Social Services. "I think we really need to shed light on what's happening in South Dakota, and the community there needs to come forward," Lujan says. "If they won't do it in a public way, then someone needs to go in with subpoena authority to be able to get to the truth of the matter." State officials have taken issue with NPR's series last year examining the issue. NPR found the state receives almost $100 million a year from the federal government for all of the state's foster care children, more than half of whom are Native American. According to the state's budget, the state receives at least $45 million in federal funding, including administrative costs and federal grants under a program called Temporary Assistance for Needy Families. The state also receives tens of millions more in Medicaid reimbursements. More specifically, Native American children are provided health care by a federal program directly through the Indian Health Service. Officials with that agency say that when native children are placed in foster care, South Dakota and other states generally move the children onto Medicaid, which is heavily subsidized by millions in federal dollars. The tribes, in their report to Congress, found a similar accounting of federal dollars. South Dakota state officials, however, have said the amount of federal money the state receives is insignificant, and by their estimation, is between $18 million if only native children are taken into account, or at the highest, $39 million for all children. They have declined requests to provide additional detail about that summation. Last year, Lujan and other lawmakers called upon the Bureau of Indian Affairs to hold a "summit meeting" in South Dakota with state officials and the tribes to address the state's compliance with the law. That summit has not happened. "We cannot stand idly by as Indian children are ripped from their homes and placed in foster care unnecessarily," Rep. Ed Markey, D-Mass., said this week in a statement expressing frustration with the delay. Responding to the lawmakers' renewed concerns, just this week the Bureau of Indian Affairs agreed to hold the promised summit this spring. In a letter to lawmakers, Kevin Washburn, the assistant secretary of Indian affairs at the Department of the Interior, said he has implemented a working group for BIA employees to better understand the Indian Child Welfare Act, and said he would attend the South Dakota summit. Several lawmakers, including Lujan and Markey, said they would also like to participate. That can't come soon enough for some of South Dakota's tribes. Raymond Cournoyer oversees foster care for the Yankton Sioux Tribe as the tribe's Indian Child Welfare Act director. He also co-chairs the coalition that wrote the report. "We can't give up," Cournoyer says. "We got to keep on moving forward, even if we make a lot of people mad at us. We're always not in the driver's seat. It's time to take control." Last March, the Yankton Sioux sent the governor of South Dakota a letter warning the state that it had no authority to take the tribe's children. Yankton, like the Crow Creek Sioux Tribe, does not have an agreement with the state to have the Department of Social Services remove children and find placement for them. Recently, state officials have told NPR that they are within legal bounds to remove native children because they always obtain a tribal court order. But even when that happens, tribal officials and legal experts say, the state is still failing to place the children with relatives, tribal members or Native American families. "You don't have any tribal court judges passing orders saying put the kid in a white home," says B.J. Jones, a national expert on the Indian Child Welfare Act and tribal court judge in South Dakota. "You know when these kids are being removed from their nuclear family, they are being taken from their extended family, and there's always a relative who is ready, willing and able to provide for a child. But DSS, they're just not doing a good job of doing that." On Yankton, Cournoyer says the tribe's letter to the governor seems to have had an impact. He says without the state's interference, the tribe has been able to place more children with relatives, keeping them close to their traditions and heritage. Cournoyer and other tribal leaders say the future of all their tribes depends on that.